The diagram below is a schematic depiction of human intelligence as an ongoing loop of engagement between (internally) perception, meaningful judgment, and action, together with (externally) the worlds of nature, culture, community, and family. 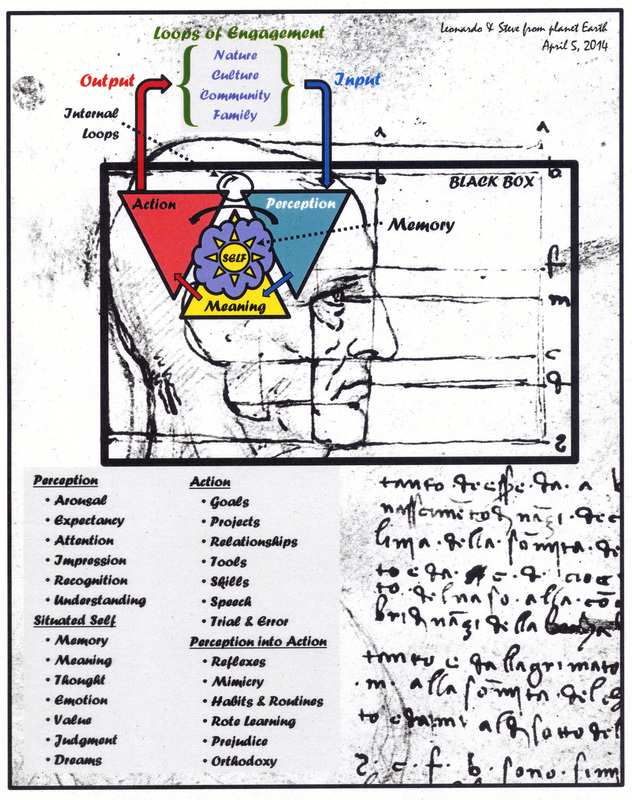 The focus of the loop is situated as conscious awareness in a particular and unique mind, brain, and body. Early on, William James stressed the streaming nature of consciousness, which flows more like a river than a train of discrete cars. I credit that sense of flow to the ongoing loop of engagement that fills our waking hours. This diagram is based on a drawing by Leonardo da Vinci. Some of the dimensions of successive stages of engagement are listed in the lower left.